Superheroes are usually of two kinds. One belongs to the category of Iron Man aka Tony Stark— Versatile, multi-personality and not-so-focused. They need to be worked to take out the hero inside them. Then there is the other kind that belongs to the Captain America aka Steve Rogers category— Always the hero whether he is Steve or Captain America and laser focused. I believe motorcycles can also be categorized like that. The motorcycle in question here is the new Yamaha R15 V3 which surely belongs to the category of Captain America. Or maybe Captain Japan. 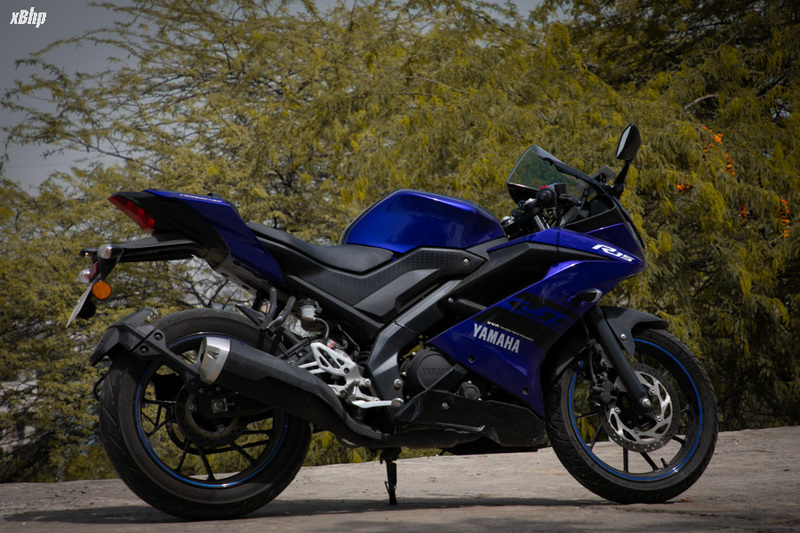 The R15 has enjoyed the status of a legend in India since its first iteration came out. 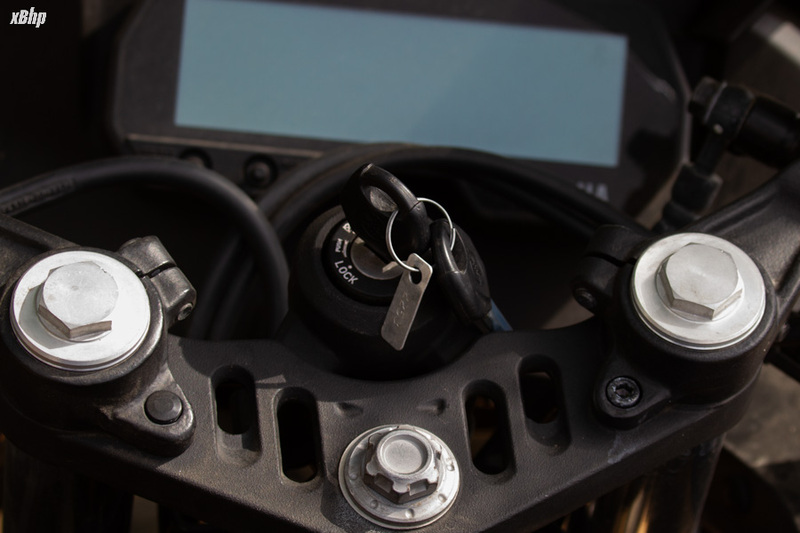 It was a track tool that belonged to the 150cc category and was priced around 1 lakh rupees. A really big deal because the likes of it were not seen before here in India. Then came the R 15 V2 deriving its whole from the R6, which is no less a legend itself. ‘Arrive Alone’ was the tagline of it and if pitted against the bikes in 150cc category, that is exactly what it’d do. Arrive Alone. I have a belief that there is a saturation point for everything. 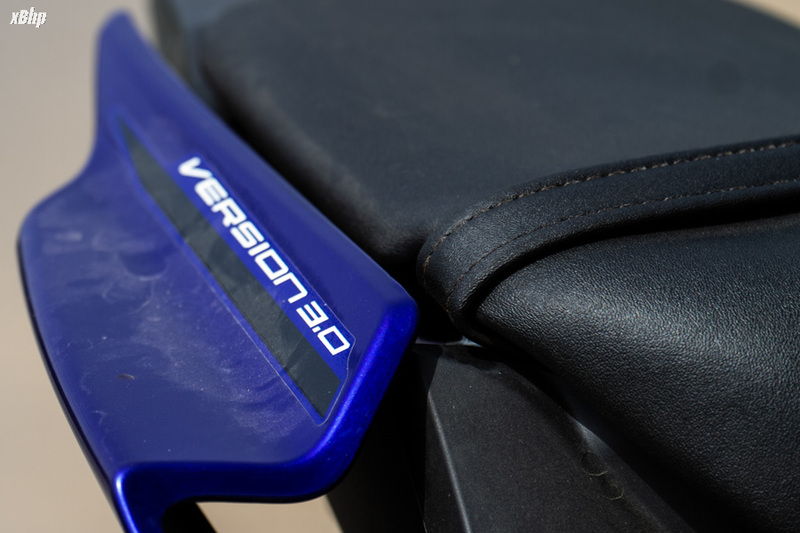 But for Yamaha’s R15, that point seemed to be pushed far away with every iteration. What was believed to be as close to perfection as it could be, was bettered by Yamaha and presented to us in the form of the R15 V3. Read on to find out how it fares in taking the R15’s legacy forward and why I called it, Captain America. Looks are… you know that right. Well that adage has repeatedly failed when it comes to the R15. 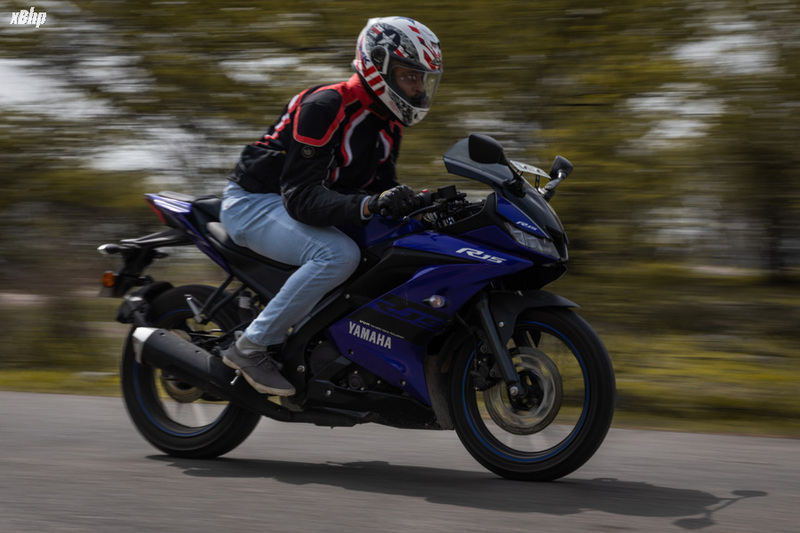 All the variations since 2008 have been effervescently good looking and this, whether one believes it or not, has been a major reason for the wild success of the R15 here in India. The R15 V3 takes this even farther. 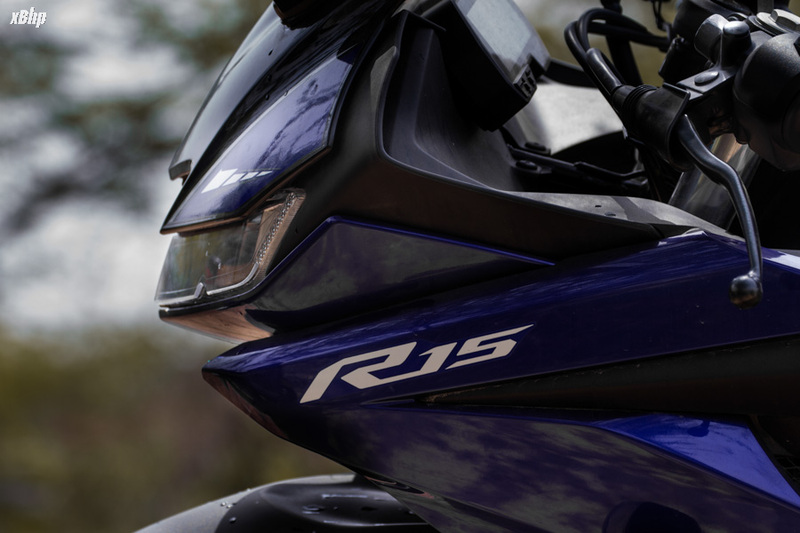 The R15 is a spitting image of the R1 with the exception of size. 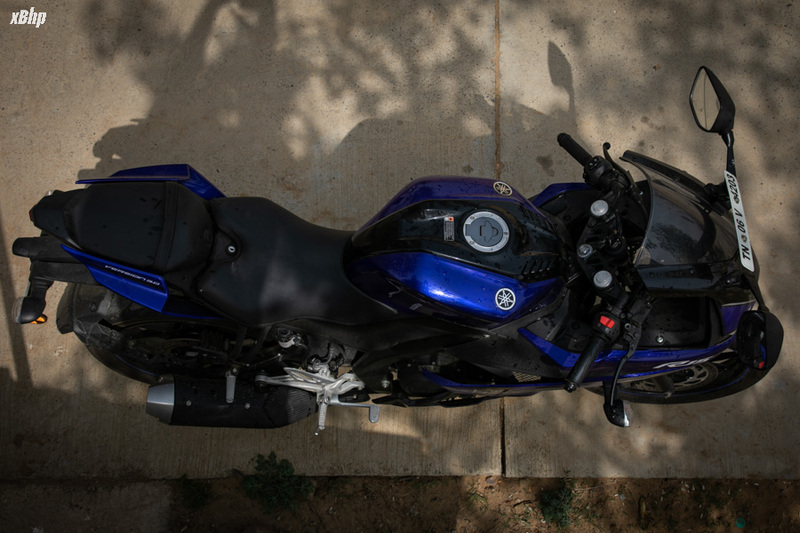 The front, the sides, the tank and especially the rear, take huge cues from the R1. What felt the most special to me personally, is the hollow-ish rear where the rear-side panels are attached to the main rear panel which houses the tail-lamp. It reminds one of the new Ford GT on which they call it a flying buttress. On the R15 it does not serve a purpose as severe as it does on the Ford GT, but looks insanely cool nonetheless. I guess that is enough about the rear. The front houses the new all-LED headlamps, the faux air-intake and a redesigned windshield. The side features less-fuller fairing than the previous iterations and lends the bike a sleek and sharp look. 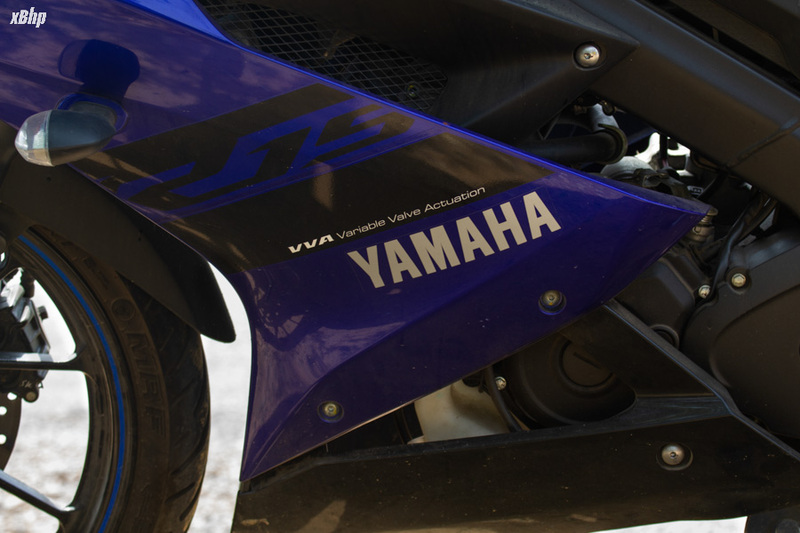 The fairing says Yamaha, R15 and another little thing— VVA Variable Valve Actuation which we’ll discuss later. The rear tyre has also taken a jump from 130 section on the previous one to the 140 section on this one. 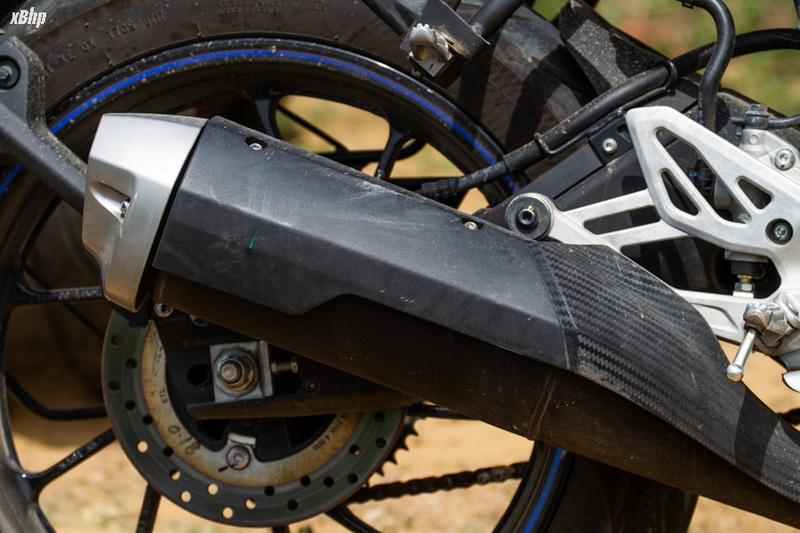 The design of the exhaust has also been changed and it has a faux carbon fiber finished heat dissipater. 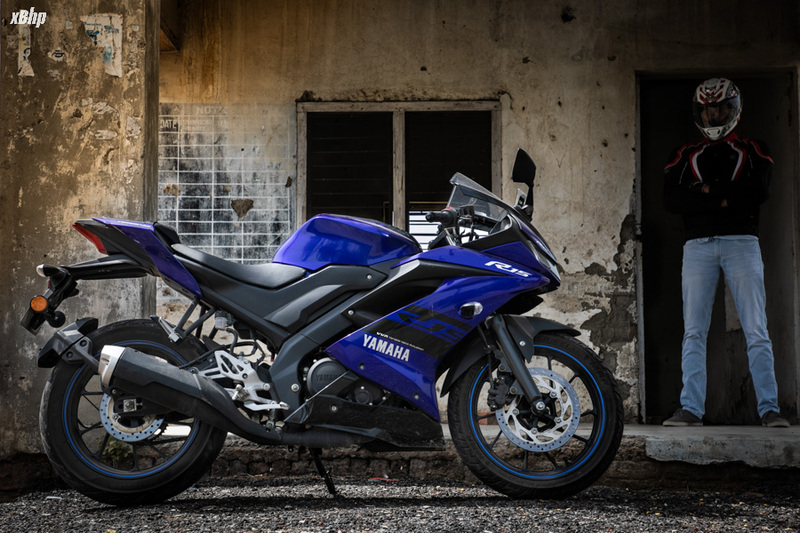 The new R15 looks leaner, sharper and more dynamic than ever and scores a 4/5 in design. Why not 5/5? We’ll address this later. 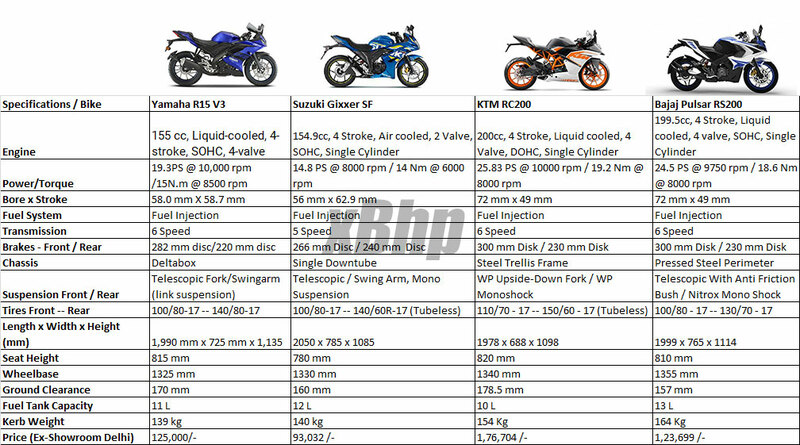 The engine capacity of the new R15 has gone up from 149cc to 155cc. And there are loads of mechanical changes to make it an essentially ‘new’ engine. We’ll explain all that via pictures and spec sheets but what does all that translate to on the road? If I had to compare it with the older R15s and put it in perspective with one line— the older R15s had a gem of an engine and the R15 V3 has got a heck of an engine. The older R15s felt a tad bit slow to start off and had all the fun stuff in the upper rev range. 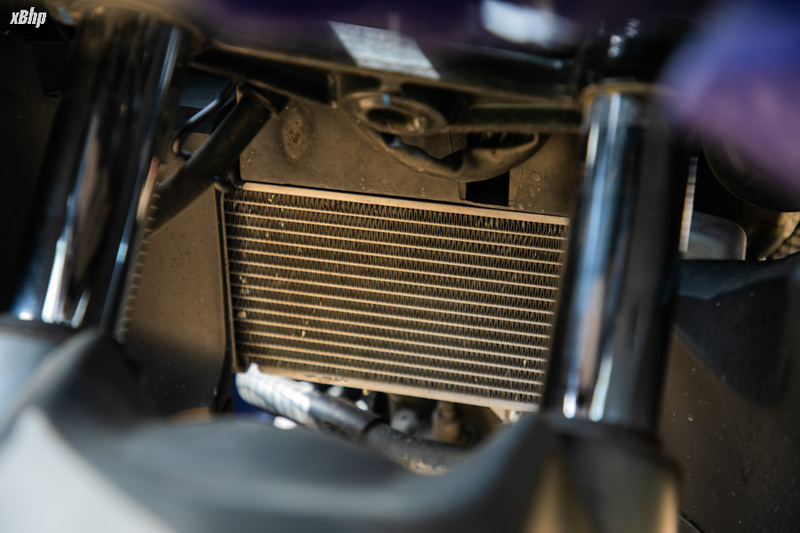 The R15 V3 has not eliminated the problem completely, but has taken care of it for the most part. 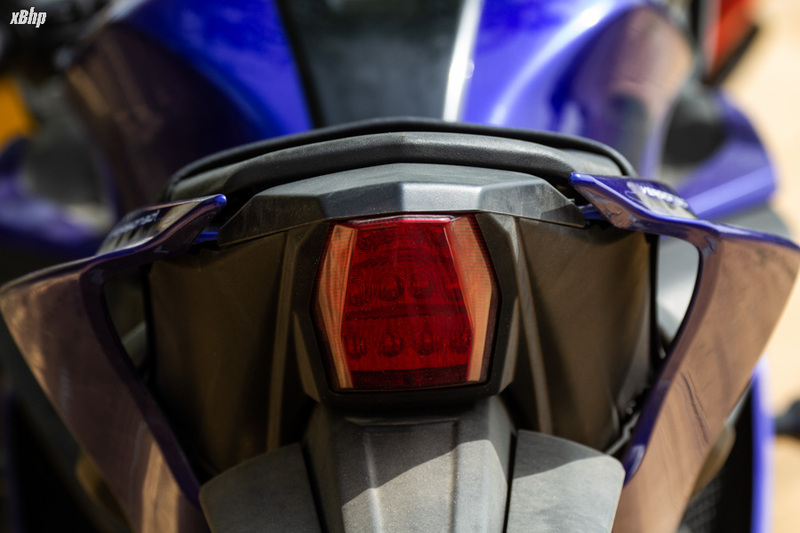 The new R15 feels quicker off the line, more tractable and manageable in traffic and requires lesser gear changes for overtakes and quickies. 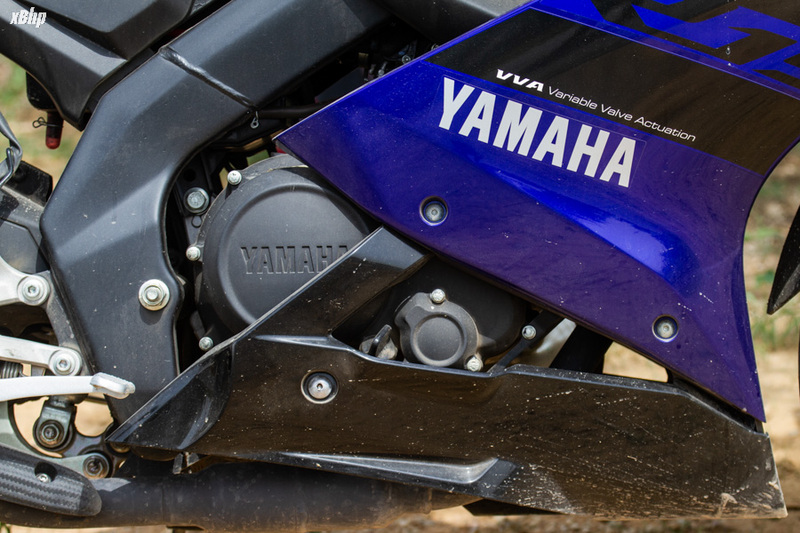 This improved acceleration is the result of VVA or Variable Valve Actuation which is Yamaha for variable valve profiling or timing. 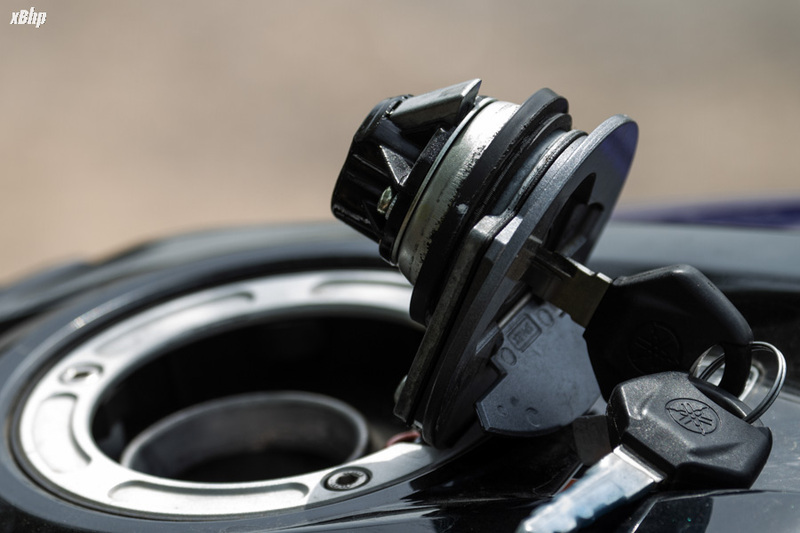 In layman terms, it has two cam profiles, the higher one of which (lift of the valve is increased) is activated post 7400 rpm. Ah well, in layman-er terms there’s a balance of power in the higher rev-range and torque in the low-mid rev-range. Is it a ground breaking change? No. Is there an improvement? A lot. Though the way the VVA sign flashes on the console as soon as you hit 7400 rpm, I felt like I just pressed the NOS button. But it was all in my head. Now the other aspect is the refinement. The refinement of the engine has certainly gone down jussst a little bit when compared to the previous R15s but it is still a very smooth engine when compared to a lot of other motorcycles. The vibes do creep in high up in the rev range but it sure isn’t a deal breaker and with the rush that the performance provides, I am sure it’ll be duly neglected which was the case with us. Power has been bumped from 17 Ps in the old R15 to 19.3 Ps in the new one. Torque has also gone up from 14.7 Nm to 15 Nm. The new R15 has got a gigantic top end for its size. I was able to do 126 kmph two up and 132 kmph riding solo with quite a lot of juice left. It may be able to 140 + on the speedo but that would require a lot of real estate. 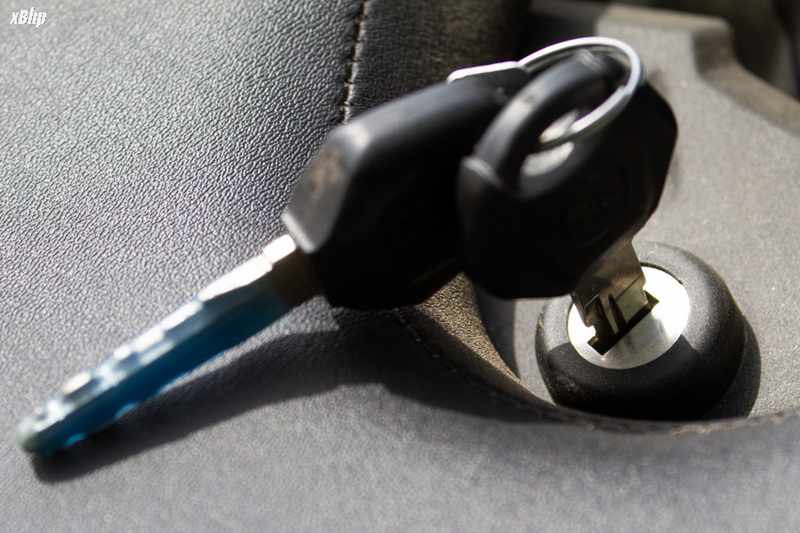 It picks up speed in a hurry and can get one out of dodgy situations as well. I would go as far as to say that I haven’t had this much fun on a motorcycle in quite some time when it comes to performance. The fueling is also precise, the throttle response is crisp. The on/off transitions are slightly jerky but that is normal and I have seen far worse. The exhaust note is also pleasing and it’s quite a delight when one starts to really mash the throttle. The gearbox is just brilliant and one of the best I have ever used. 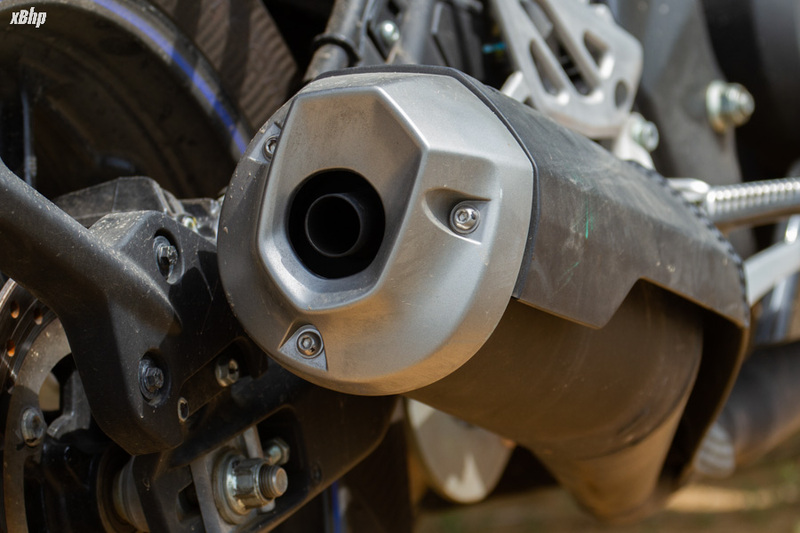 It is precise and smooth and everything the gearbox on a motorcycle should be. 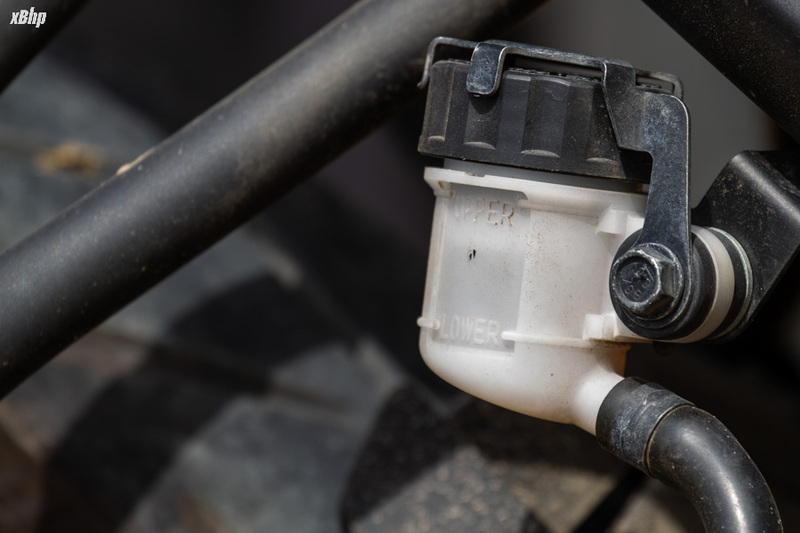 The slipper-clutch makes the clutch action light which helps a lot when stuck in bumper to bumper traffic and also helps in rapid downshifts keeping the rear in line. It does not have earth shattering power but then again, I wasn’t riding it on a track so I didn’t feel the need for it. 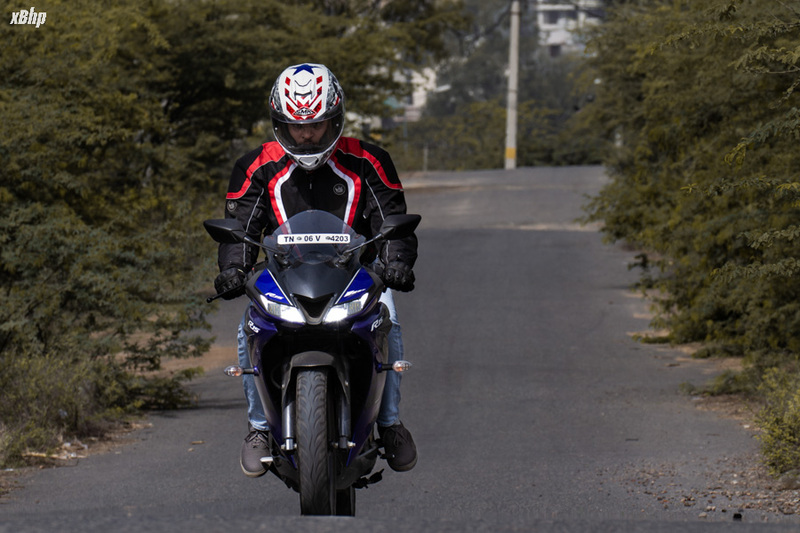 Filtering through traffic or wringing the heck out of it on open roads, the R15 V3 is fun in both the scenarios but obviously the latter is preferred. This is probably why smaller bikes are missed by the people who only ride big bikes. They are just so much more fun and usable. And because of all that, the R15 scores 4.5/5 in this department. The title of this section might have told you the whole story but I just like typing a lot so I’ll go ahead and expand on it. All the R15s have excelled in this department. This one does so too. It is more sure-footed and more aggressive than before. The wheelbase is shorter and the geometry combined with the Deltabox frame provide what one can easily refer to as razor sharp handling. A slight push on the inside bar saw the bike leaned into the corners, laughing on my limited experience and skill. It just eggs the rider to push it harder. The turn-ins and side to side transitions, both are deceptively quick. 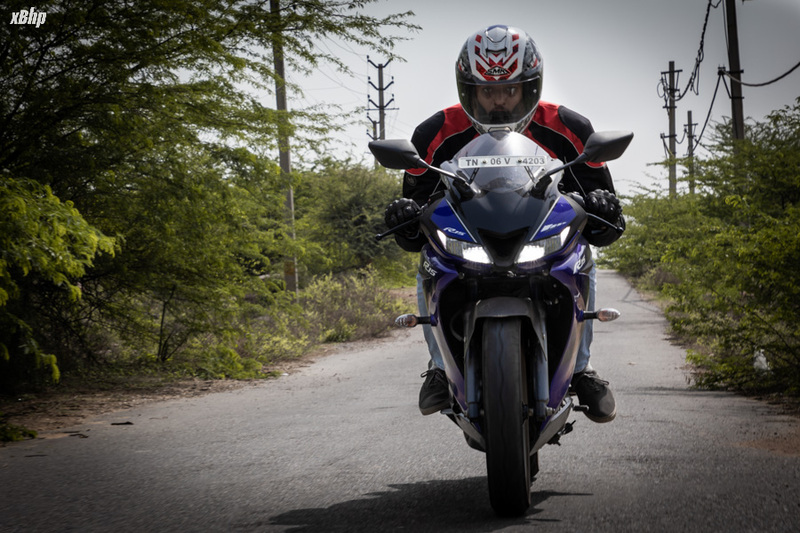 The bike slays the corners like a pro and thus making the rider look like a pro. On the straights as well the bike holds its own even when it’s close to its top speed. Riding in the city, it handles very well but the low end still lacks a bit but it is great within the city nonetheless. Wow, I thought I will talk a lot about this part but I am short of words here. It is a phenomenal handler. BELIEVE THAT. Now the not-so-impressive things. Firstly the brakes. They are okay. Surely not enough to handle this hoot. 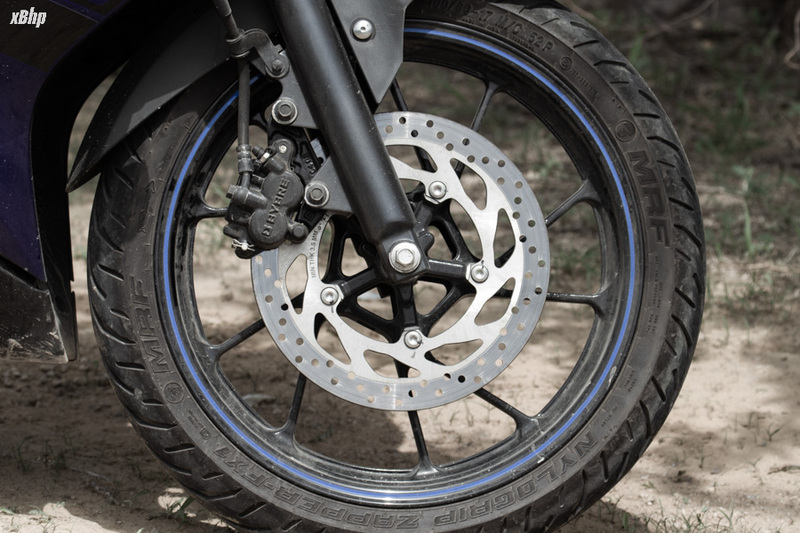 They aren’t bad but bringing the bike to a stop from triple digit speeds takes some doing and brakes just seem overworked at that point and thus the braking performance is underwhelming. 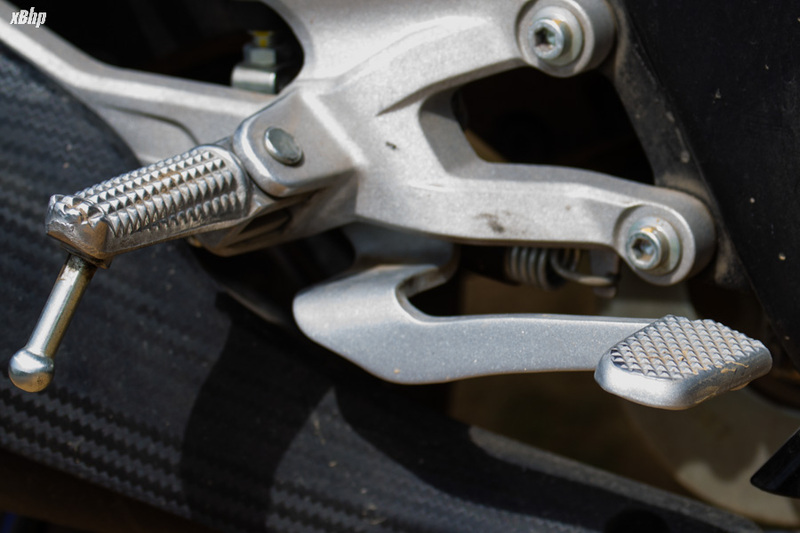 The brakes aren’t necessarily bad but the bike deserves better. The next thing is the front suspension or simply the front end. I say front end to include the front tyre as well. Again, they aren’t bad but not good enough for the motorcycle. The problem here is that there isn’t a lot of communication from the front end to the rider. It feels like you hit it off well with a girl and suddenly she starts to reply late. More feedback is what I would have liked here. 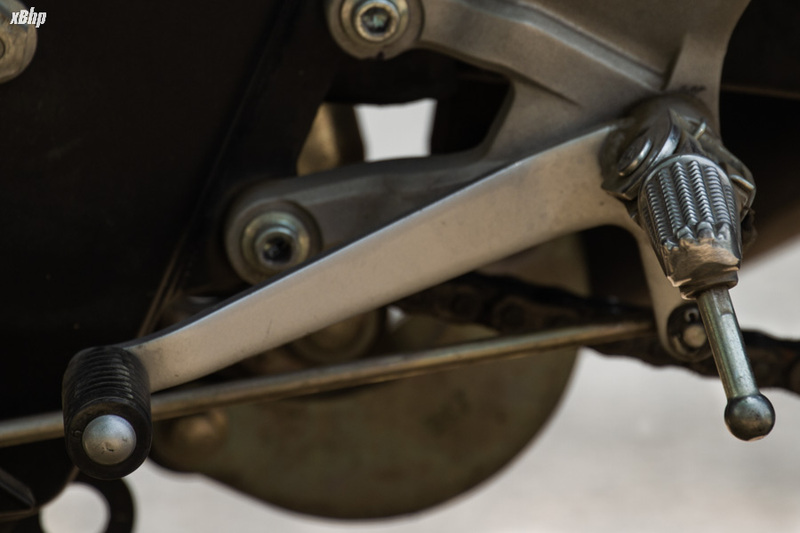 The rear suspension and tyre on the other hand, take care of things on their end. (We got the one with Metzeler at the rear). 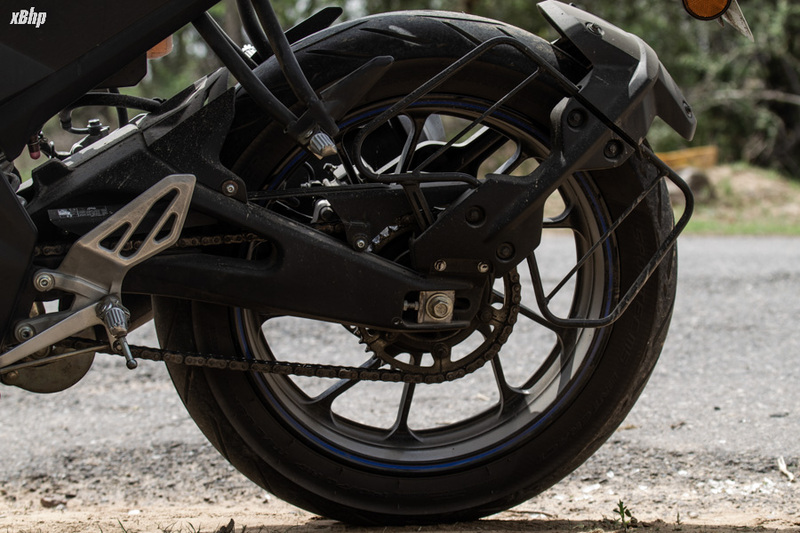 The suspension setup is obviously somewhat stiff to aid poise of the bike in the corners but the potholes and undulations on the road are surely going to be felt. The ground clearance is sufficient enough though. 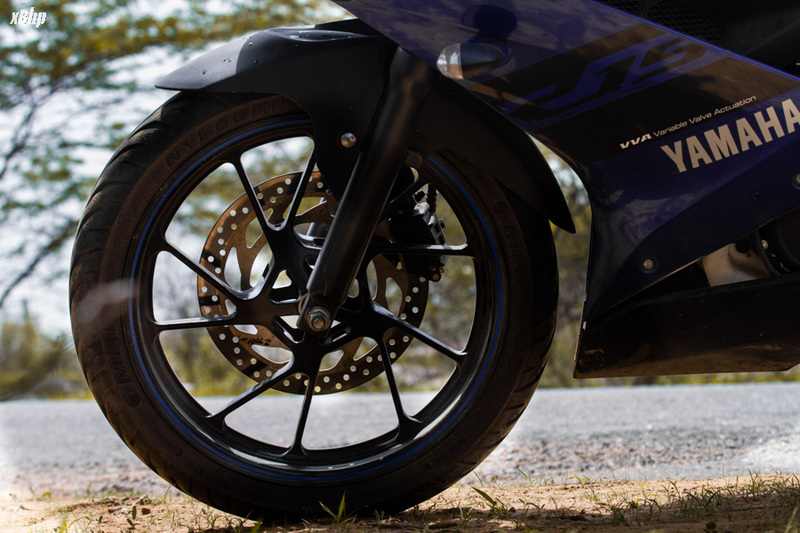 So even with the feeble front and okay-okay brakes, the R15 V3 scores 4.5/5 in this department. Comfort? Nope. Never heard that name before! Yep. The R15 V3 or any R15 for that matter has not heard of comfort before. And… they don’t care either. 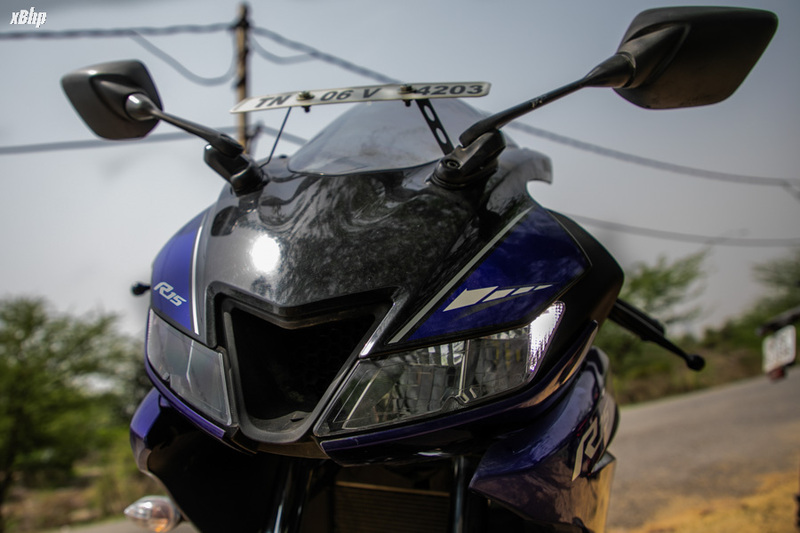 The R15 V3 is even more focused. And that is why I called it Captain America. 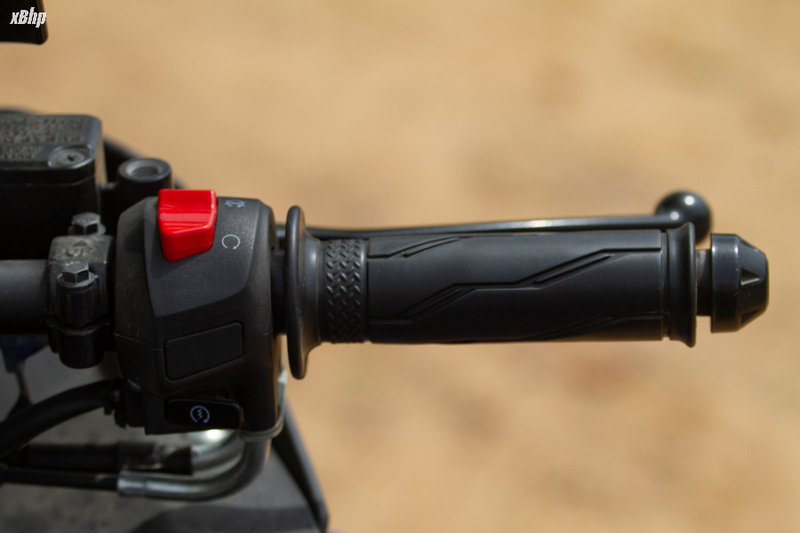 The seat height has increased, the footpegs and rear set and the clip-ons are low. If you are riding the R15 V3 fully geared up (Which you should. Always. 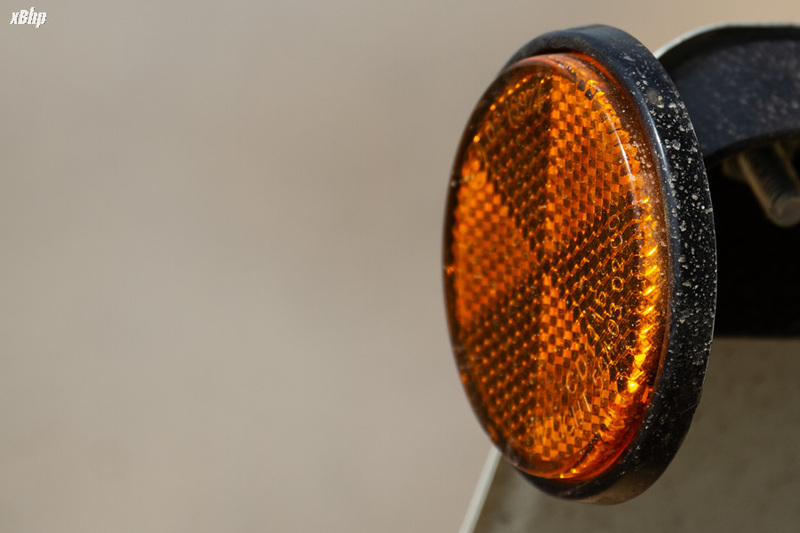 ), other people on the road look at you like at any moment, you are just going to drop a gear and exit the traffic with a wheelie while revving the heck out of the bike. Exaggeration? No. The riding position is actually that committed. 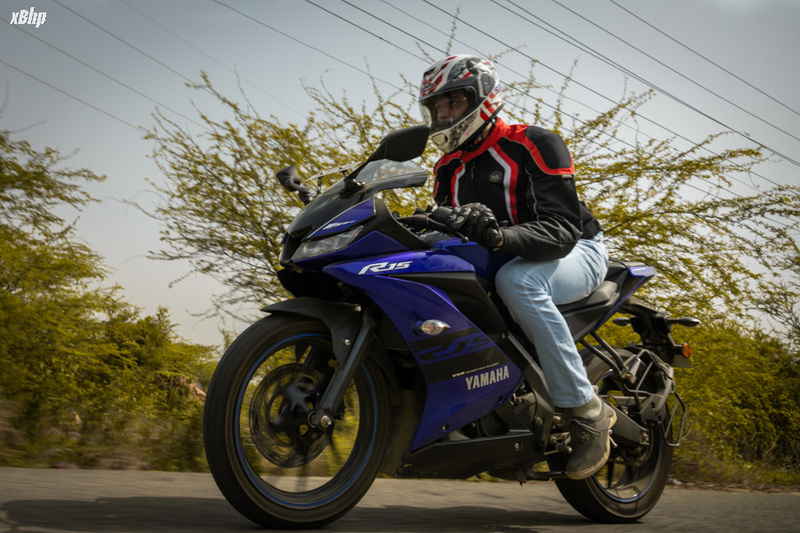 It is a very demanding task to ride the R15 V3 for longer durations. Even though the seat is plush & roomy and the tank contours let the rider grip the bike well, long tours are a no no here. I being 6’3 found myself a little cramped for space and was not able to accommodate my legs easily. Moving further back in the seat helped a bit in that regard but the R15 V3 surely does not like very tall people. 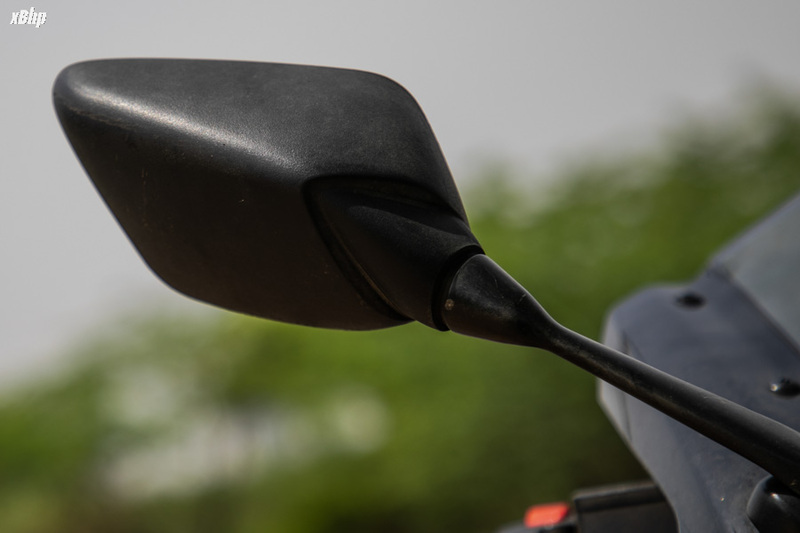 The windscreen though is very functional and protects the rider from the headwinds when one is north of the triple digit mark. 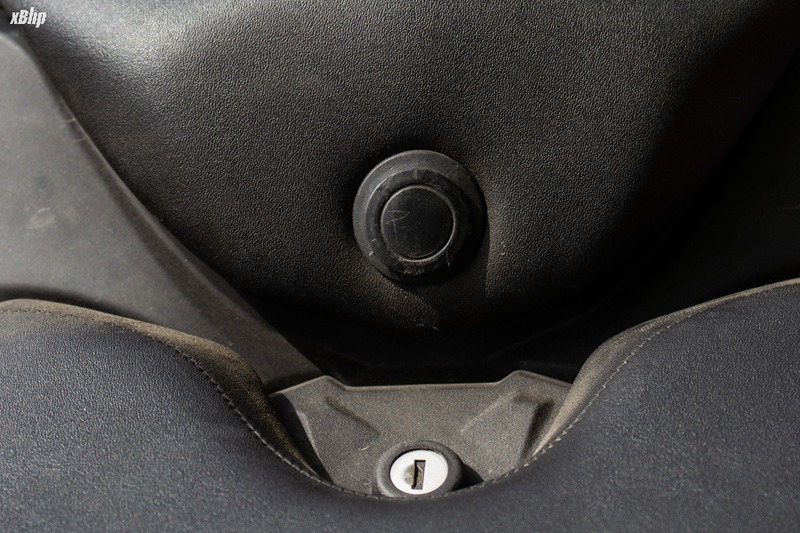 So, even with a comfortable seat, the R15 V3 is not a comfortable motorcycle by a long shot. But being fair to its nature, on a track or a short stint, I’ll give it a 5/5. And when the reality gives me a stiff kick, I’ll grant the R15 V3 2.5/5 in this department. Mileage: This was quite surprising but even after the increase and power and performance, it returned a mileage of around 38-40 kmpl. Which is very surprising because weekday traffic and weekend thrashing constituted the majority of our review and yet such impressive numbers. Nice! 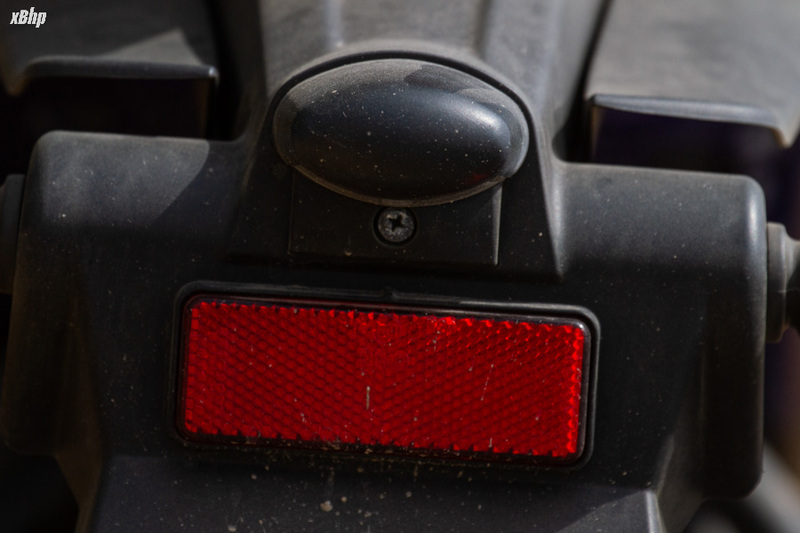 Rear-view mirror visibility: The rear-views are average. I would have liked a wider field of vision there because I am not very fond of looking at my elbows. 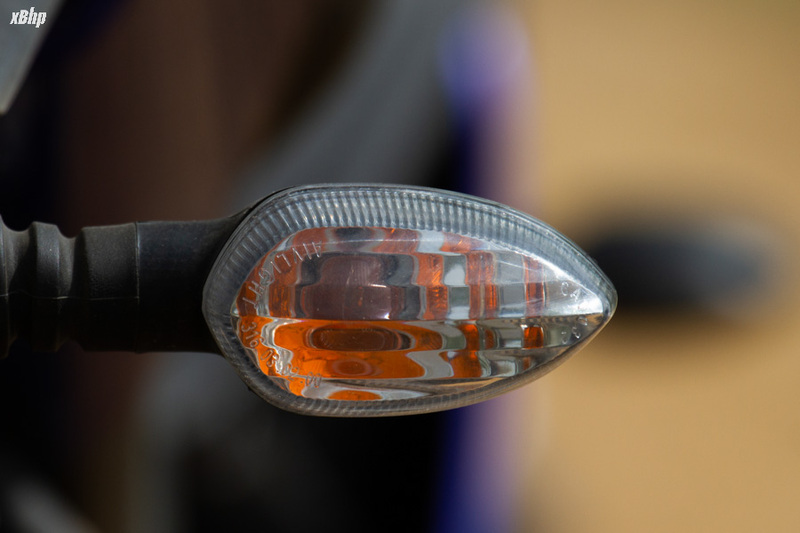 Headlight performance: The all-LED hoopla is starting to miff me now. It makes one go out there with somewhat unrealistic expectations and boom. It all comes crashing down. Anyway, the illumination is okay, the spread was not so much. Build Quality: This is where my biggest surprise came. I mean come on. It’s a Yamaha. It’s got to be finished well. No, it isn’t. Weld marks here and there and uneven gaps in panels was quite evident. It isn’t visible to other people so the egos are safe but still, looking at something you paid around 1.4 lakhs for, it doesn’t exude the premium-ness. The switchgear and the indicators belong to the same category. And that’s why I took away 1 point and gave it 4/5 in the looks department. Instrument Cluster: Fully digital instrument cluster looks and feels good. Buttons on it not so much. 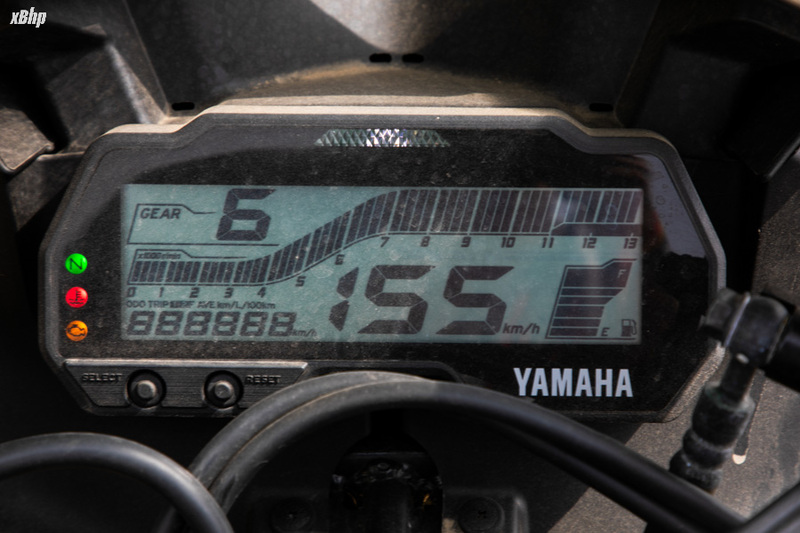 Displays instantaneous mileage, average mileage, average speed and a few more with the standard information. The R15 V3 is a very very good motorcycle. The negatives I put forward were there simply because I expect that much from someone related to the famed ‘R’ family. It isn’t comfortable but then most bikes of its class aren’t. It isn’t meant to be that. I will even go as far as to say that the money spent on an R15 V3 is money well spent. It justifies its price tag comfortably. The only real gripes here is the fit, finish and switchgear. But even with all the drawbacks, it has been received very well and it deserves it. It has got a lot more competition now than when the first R15 came out in 2008, but it is still very well armed to deal with it and maybe this one will also Arrive Alone at the finish line on a track. 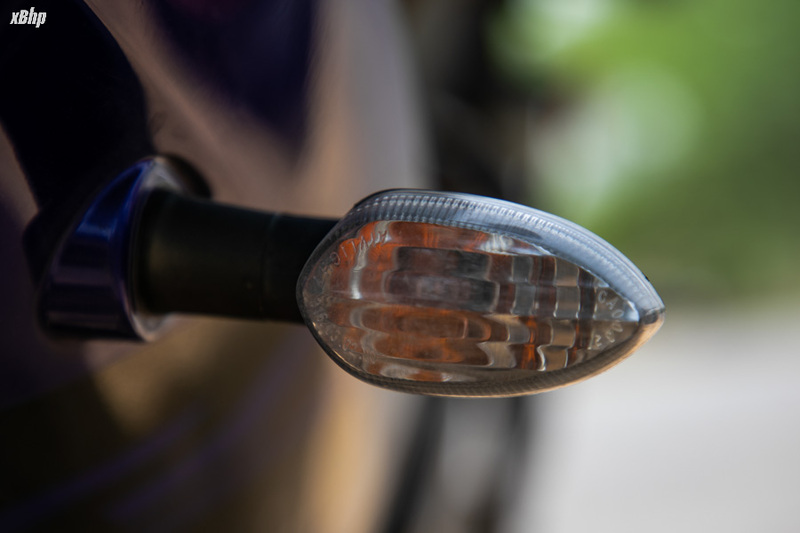 Last edited by xBhp; 07-30-2018 at 07:47 PM. chiragsthakur, kc_1602, WindPacer and 1 others like this. 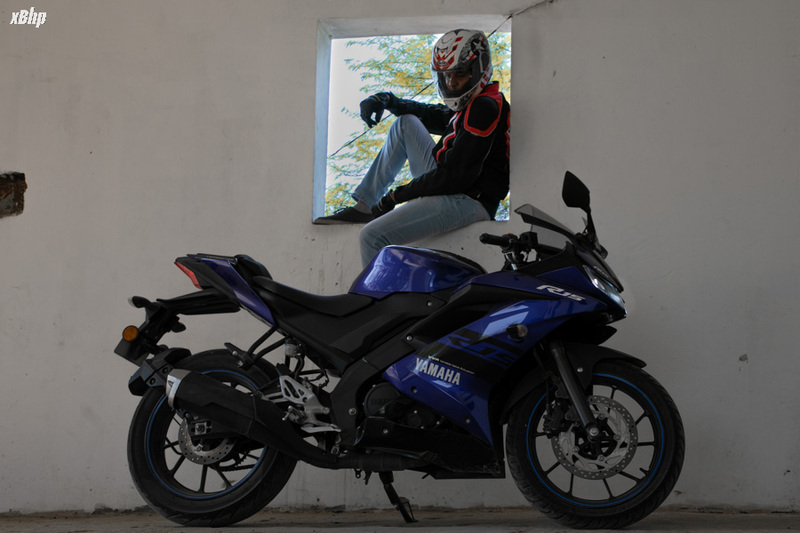 Being riding a V2 since last 5 yrs and 60k kms, I would say R15 be it v1,v2,v3 is the best bike in the segment. 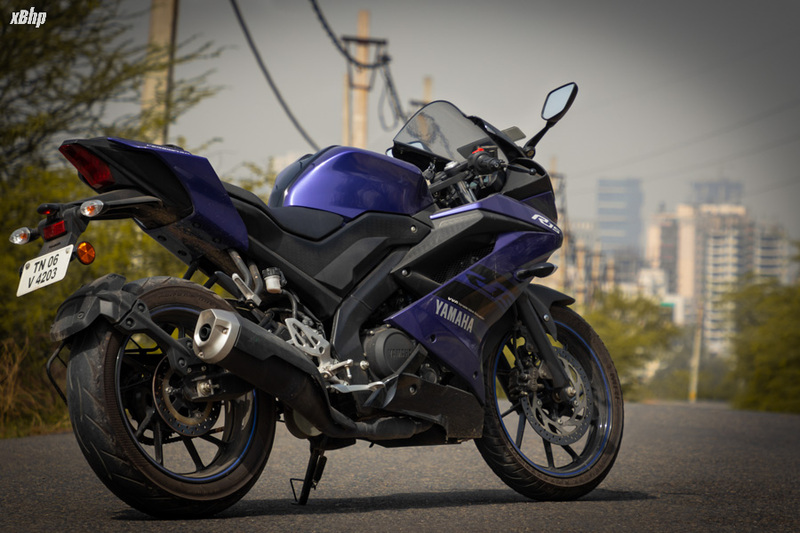 And as we say "If its a Yamaha, it has to be good"
R15 only the name is enough .. I am proud that i own a r15 (v3). 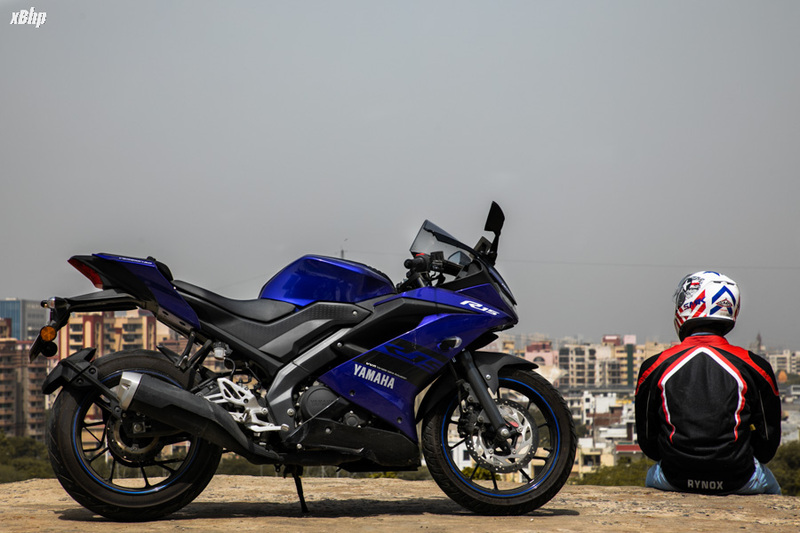 Although the quality has been droped in the latest version .but it still one of the best 150 cc out there , the quality can be ignored as r15 has the best advanced technology among its rivals. Only selected riders are made for R15 .. its not made for boring comfortable oriented peoples. I test ridden other bikes in its price range ..but i didnt feel the satisfactory as i am young and want something more thrilling amd exciting. But when i sat on r15 v3 and took a test ride .. i cant express the feeling the happiness i got .. i instantly felt in love with the R15 .. Even after 5 months i still get the same feeling when i test rode it.. The perfect way to choose a bike rather than power figures and mileage. Test ride, see how the ride feels and check the comfort. The same way I felt with unicorn 160 and FZ25.